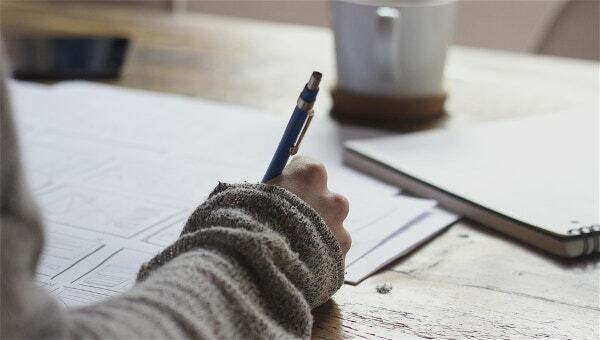 Take quick points and jot down meeting advances with the help of minutes templates that allow you to draft minutes for your business meetings and its latest updates. These sample templates provide instructions and correct format for creating your own minutes. The example helps with the right set of words to be used for putting and jotting down all the points and instructions and crafting minutes. 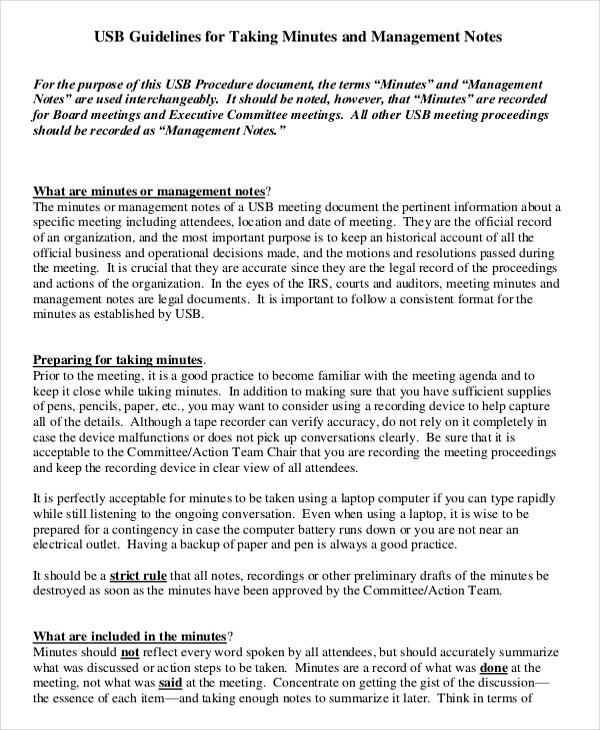 You can also see Business Minutes Template. You can easily change them according to your idea and can download in various formats according to your need and convenience. Download these templates that are available for free and create your personalised minutes today. You can also see Minutes Template. This is a pdf format document whose purpose to guide the user in taking minutes. The template is customizable- user can replace all the information in the template with theirs i.e. including the images e.g. the logo of the company and other elements included in the template. The template can be converted for use through Microsoft Word software to make thorough changes. 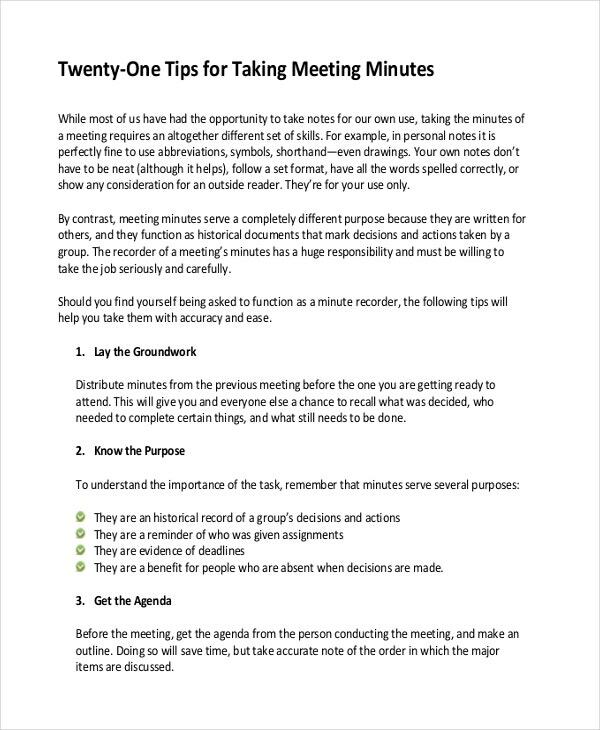 Here is a template created for taking minutes for corporate meetings. The template is prepared using Microsoft Word format and can be downloaded in either Word or PDF format. 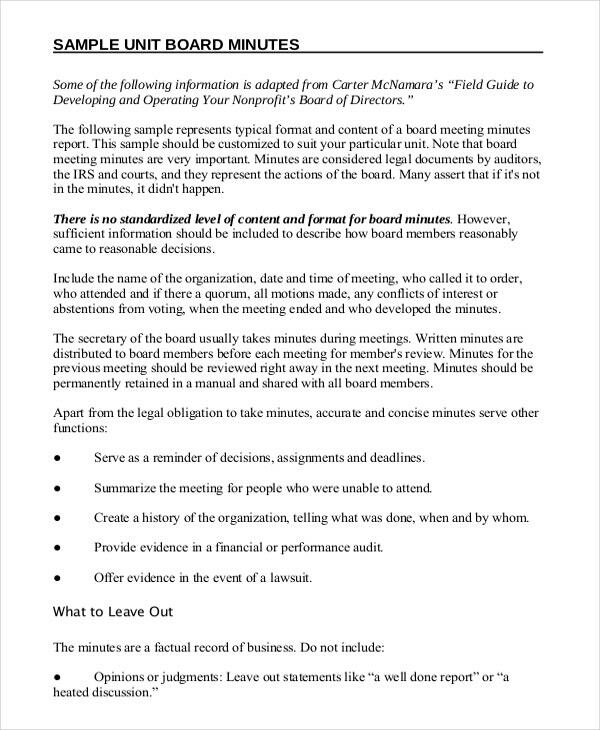 The template helps the secretary of the corporate board to write minutes with less hassle. 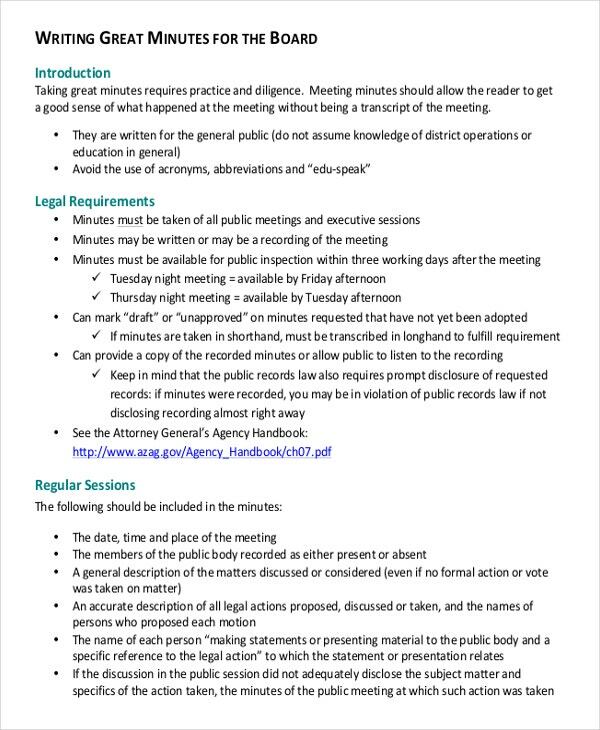 Through the use of this template, you are assured that no content required in board meetings minutes left out. This template is prepared for use during board meetings. The template is used by the school heads or the principal. The template acts as a guide, and it also used to save the time wasted while preparing the minutes of a meeting. 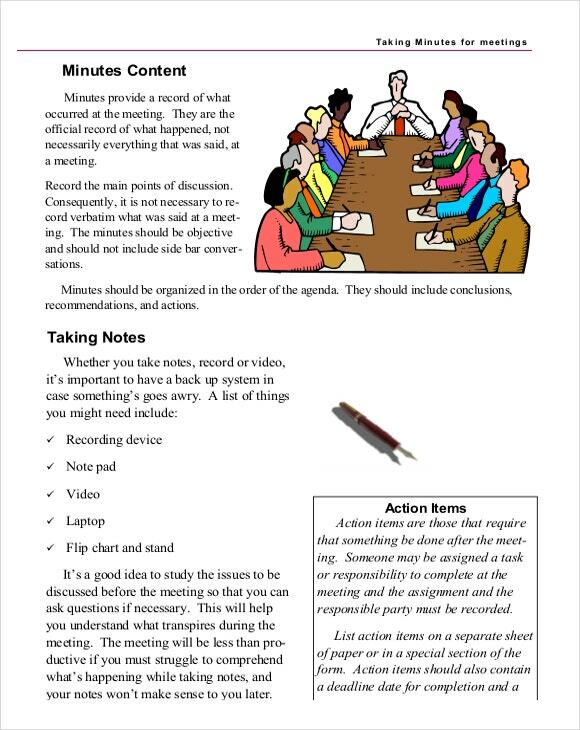 School heads can download and customize the template to make them specific for their meetings. 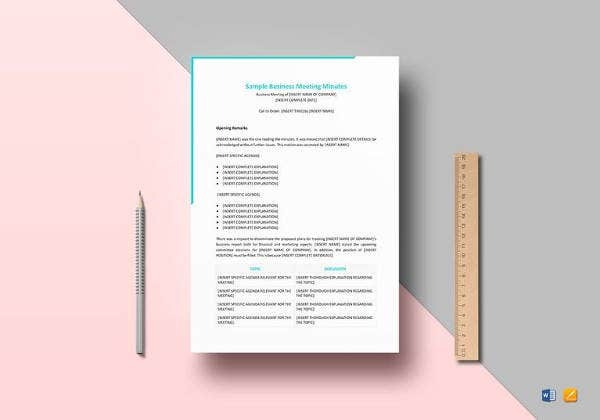 Business agenda minutes pdf is a template that is prepared for secretaries recording minutes in a agenda business meeting. 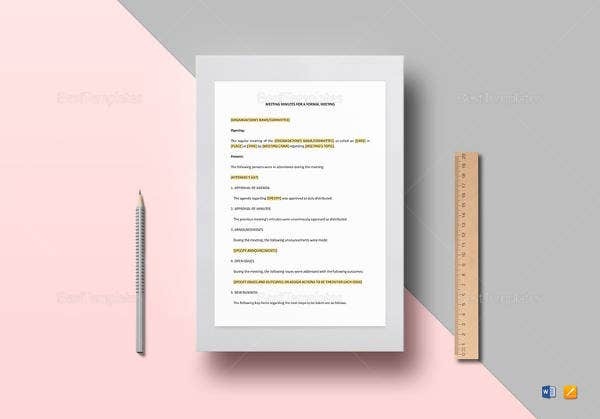 The template is either used as a guide to writing down the minutes and give the user a glimpse of the format or be customized- users can replace the information included on the template with theirs. > When is Taking Minute’s Template Required? Taking minute’s template is needed in an instance where the time for minute’s preparation is inadequate. 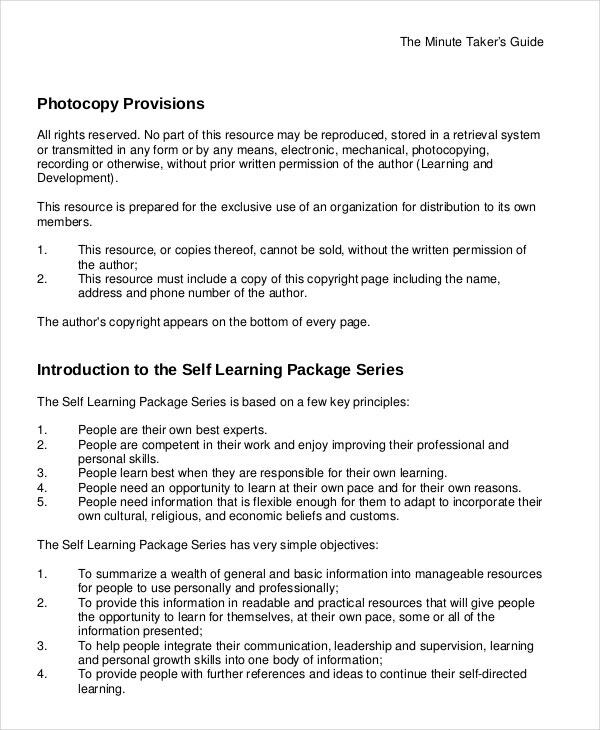 The templates give the user a guideline which helps them to speed up the process of writing the minutes. 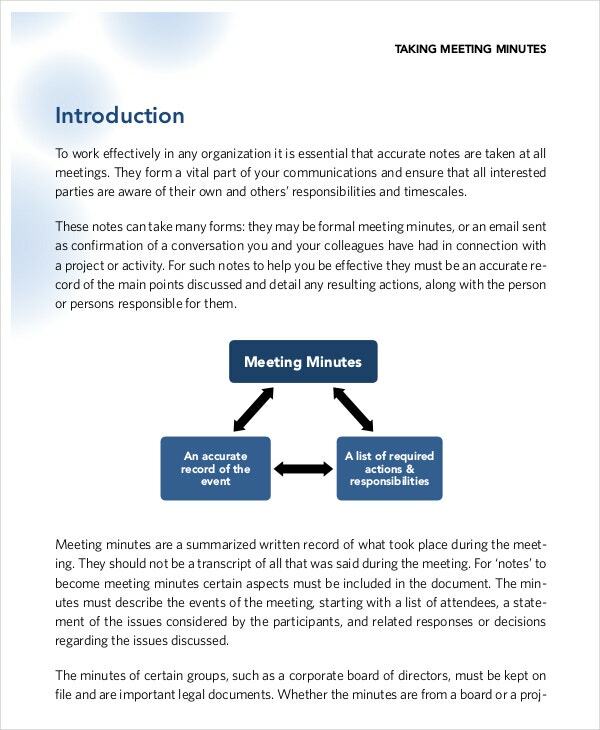 Another instance of when the taking minute’s template is required is when the user has no clue of writing the minutes, and he/she is expected to write minutes of a particular meeting. You can also see Minutes Writing Template. 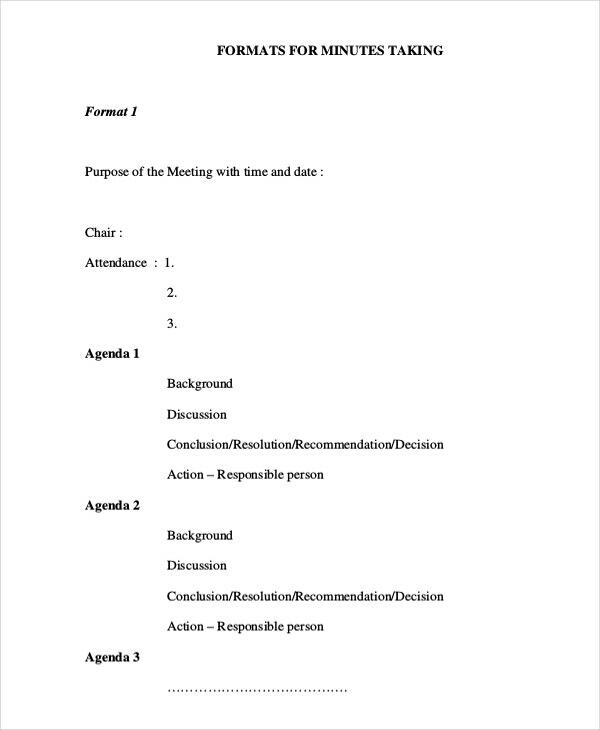 Minutes of a meeting have some uses which make the important and needed after every meeting that happens some of the uses of the minutes are:To confirm a decision made during the meeting,To have all agreed actions to be taken recorded, Record allocations of tasks and responsibilities, Provision of meeting details to anyone who did not attend and serve as record of meeting outcomes and procedures. 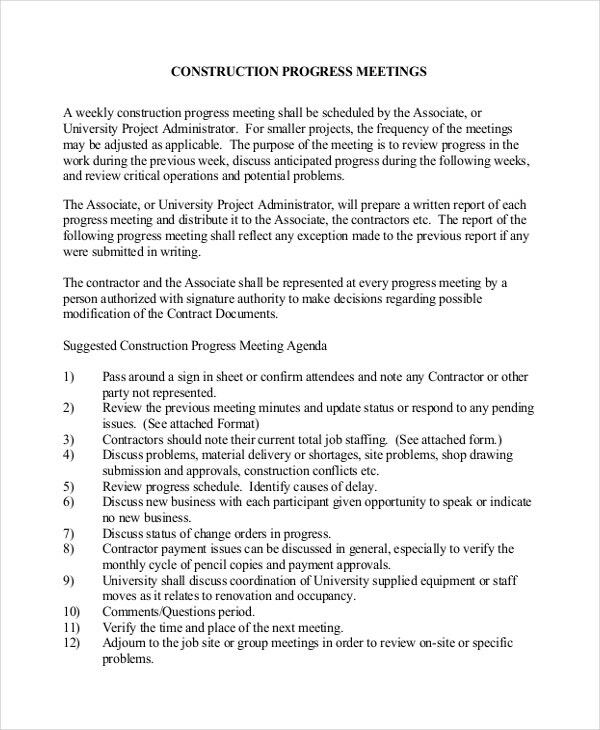 You can also see Construction Minutes Template. 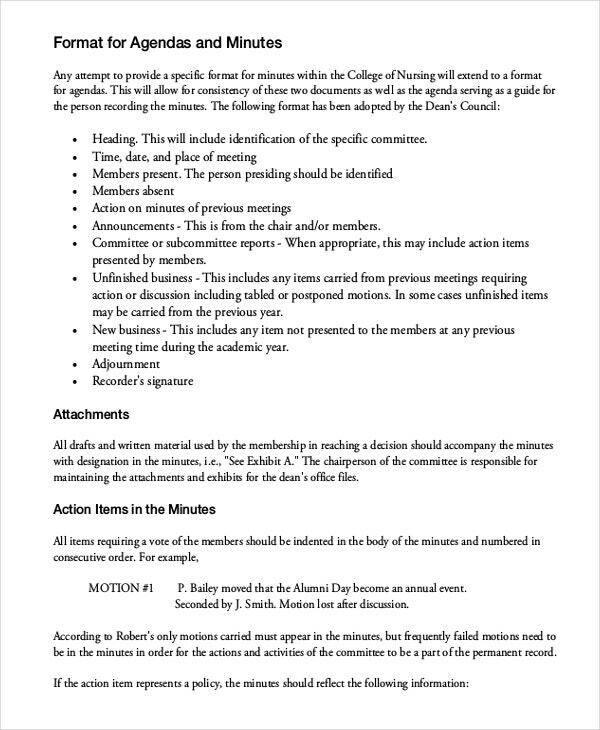 You can write minutes of the meeting by writing the title in block letters- the title should include the name of the group, the venue of the meeting, and the time the meeting happened. The next section is to list the members presents, absents and with and without apologies. The agenda of the meeting and the matters arising from the last meeting and each should be under different subheading. The actual minutes- these are the issues discussed in numbers Moreover, the conclusion. 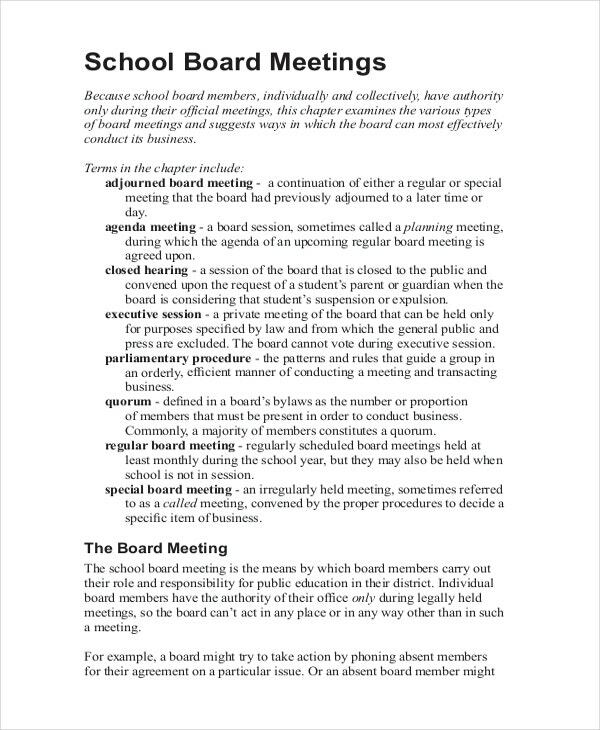 You can also see Board of Director Minutes Template. 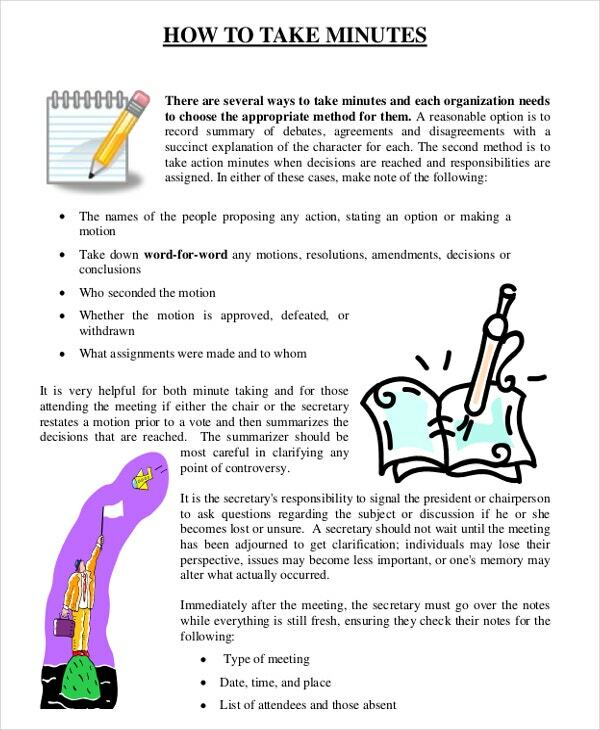 Minutes taking templates are available in various formats and types for free download on our site. They are professionally created and fully customizable. Some of the common formats available are Microsoft Word Format and PDF format. If you’ve been looking for quality minutes taking a template, then you should look no further since you already found a reliable source which is our site.